But anyway, this is minimal music and usually without any pop hooks. Perhaps catchy melodies would only interfere with the "less is more" philosophy. The songs are based on very lifeless and robotic grooves and unnatural chord progressions, which naturally has a tendency to grow monotonous. The only chance of them being any good is if the groove is catchy in a primitive way or successfully hypnotic. 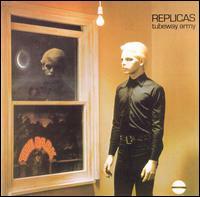 In Tubeway Army anyway, the instrumental arrangements aren't always interesting in of themselves. He doesn't waste too many notes or goes too deeply in excess, although this album certainly has a few moments of flooded electric guitar solos and synthesizers. Yes, this is all quite different music, but just because he's trying something different doesn't necessarily mean that his music is good. Speaking as someone who think he enjoys overly repetitive, "minimalist" music (I have a bunch of Philip Glass CDs, so there you go), some of this music is awfully difficult for me to take. Needless to say, if the farthest you've ever ventured in your musical endeavors from Carpenters albums is Dark Side of the Moon, you're going to hate this album like you hate cancer. As you might have guessed, this was strongly influenced by David Bowie's and Brian Eno's Low --- His music has that stripped down and vaguely 'incomplete' feeling to it. It's funny that I can even imagine Numan's voice being a cross between Bowie's and Eno's singing voice. He has Bowie's same tone but Eno's plain stability. He doesn't have the greatest voice, but I guess any fancy vocals would interfere with his "less is more" policy! Besides, his voice suits the robotic tendencies of his music perfectly. All that said, Numan doesn't seem to be to the point where he realizes exactly what made Low so charming, but ... well, he was certainly close enough to warrant a second try at it! I'm just going to say that this album has its problems, and Numan had a ways to go before he'd really master this. That's arguable, though, and I'm sure there are going to be some people foaming at the mouth after reading that. Undobutedly, some fans prefers this more guitar-oriented Tubeway Army to his more synth-pop oriented albums of his peak years Telekon and The Pleasure Principle. Honestly, his musical "minimalism" didn't change much through the early '80s (the extent I'm familiar with him at the moment), but I believe his creativity only flourished. Most importantly, his later albums have much more interesting arrangements, which sometimes go directions that are worth treasuring. Gary Numan is so much fun! ... OK, not everyone will think Gary Numan is fun. I guess I could attempt to write "objective" reviews even though everybody knows that's impossible. Critics with the delusions that they are objective are really awful and not fooling anybody! Well, it's my subjective opinion that Gary Numan is so much fun! But I do realize that not everyone will think so. God knows why. 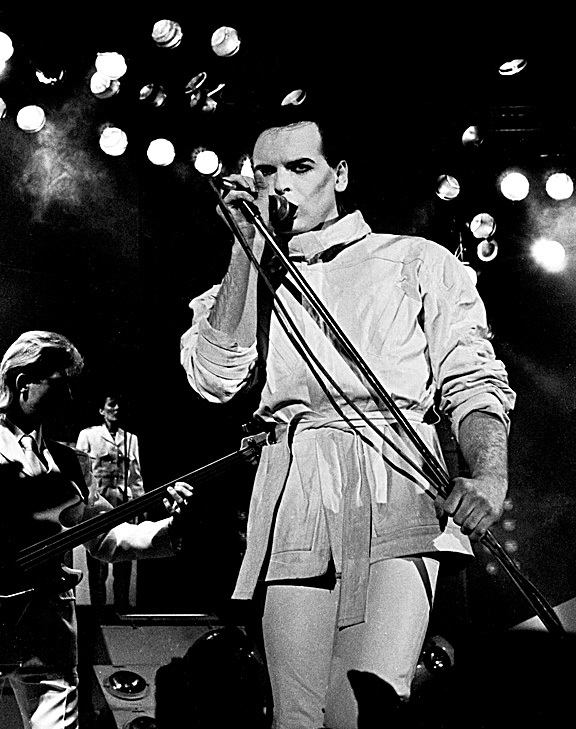 If you were paying attention to my review of his previous album, Tubeway Army, Gary Numan's primary purpose in rock music was to be a minimalist in the same vein as David Bowie's and Brian Eno's Low. That's even more evident with Replicas to the point when some of the songs are sounding like Low imitators... Well, not quite of course. "Down in the Park" reminds me quite a bit of "Warszawa," but if you listen to each song you'll probably note that they had different musical purposes... "Warszawa" is an impressionist piece about Warsaw, and "Down in Park" is a dark and seedy sci-fi song. One blatant Bowie attempt was the closing track, "I Nearly Married a Human," which sounds a lot like he listened to the last half of Heroes a bit too much! Though I do like the last end of Heroes, Numan's attempt seemed half-hearted and not even half as vibrant. Naturally, I appreciate the attempt! The big change Numan had undergone in respect to his debut album was that he's experimenting much more with synthesizers. Only a couple of these songs are guitar-oriented! Furthermore, his music sounds more robotic and cleaner than ever! Even though I read all the time that Gary Numan writes music that anybody can write, I persist with the opinion that he is an exceptional artist... And that shines through most of these tracks. The best example of Numan's talent would have to be the opening track "Me I Disconnect From You." The groove is strangely hypnotizing and somewhat catchy. Numan doesn't try to write pop hooks at all, but it somehow still manages to capture the ear. I think this album is quite an improvement over the debut album. Most importantly, the instrumentation is much more diverse and wild. But he'd still get better. 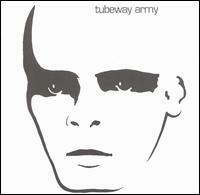 Numan wanted to go even further, and he would end up dropping his band, "The Tubeway Army" after this release. Fortunately, it seems his future albums are better! This is where it all came together for Gary Numan. The first thing he did was get rid of the band. Well, either that or the band left, because Numan no longer needed a rock combo. He just needed electronic drums and a synthesizer! At any rate, this is where Numan reached both his commercial and critical heights. Many critics don't seem to care for anything Numan released after this; some UK critics went so far as to genuinely hate him by the mid '80s. The British, apart from a loyal legion of fans, gave up on him only a couple years after this. Of course the Americans were much more interested in stuff like Hall & Oates. .......Nothing against Hall & Oates. 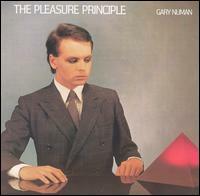 This album contains Gary Numan's biggest hit single ever, "Cars," which even appeared on the U.S. Top 10 charts. It unfairly branded him as a one-hit-wonder (he's much more complex than that), but it's true he never came up with a hit nearly as successful. What's most important to know about The Pleasure Principle is that it's jam packed with killer material; its merit doesn't lie merely with "Cars." I don't even think that's be best song on the album. Though he's still taking severe hints from Bowie's and Eno's Berlin Trilogy, Numan became more of his own man here. This music has its own, unique flavor, and it's sometimes difficult to tell why some of these songs work. Take "Cars" for instance. I wouldn't be able to tell you that the melody is very catchy; he mostly repeats the same six notes over and over. But I can tell you that his arrangements are classic, and the rhythms and the timing keeps it engaging. Furthermore, he keeps it accessible enough to be enjoyed by all. It's a well done song. His instrumental ambitions have become quite advanced here. This is similar to Replicas, but he's getting even more creative with the synthesizers and sound effects. Also on a few occasions, he's bringing in a piano and violin to give those songs a nice effect. My favorite song of the album, "Complex," is probably the best orchestrated track of the album! The violins are beautiful. "Films" is an especially notable song for the same reasons. Numan creates such a thick and sort of "doomsday" atmosphere, and that mood is utterly convincing. Well, I spent enough time rambling about this album, and I do much more of that in the track reviews!! I'll close this section by saying that there's no contest that anyone in the market for getting one of his albums will probably want to start with this. It's his critical and commercial peak, and I don't think that's unjustified. If you end up loving this album, then you'll find plenty of reason to go onto exploring his other works.